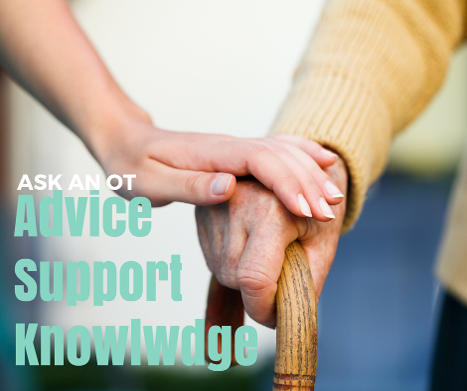 If you have landed on this page and you don't really know what an Occupational Therapist (OT) does or why you might need to use one, I hope you find the answer here. If you are still unsure please pick up the phone and call me. Occupational therapy is often mistaken for something having to do with Occupational Health or career counselling. In fact, Occupational Therapists focus on the activities that give daily life meaning. Occupational Therapy helps people recover or develop skills needed for the activities of daily living, including self-care, leisure, independent living and work. Although most OT's work in hospitals, in schools, in nursing homes and with patients in their own homes, there are a growing number of private Occupational Therapists... and that's what I do . I work with other independent OT's to give both local and national cover. It's what you do every day that makes a difference to the quality of your life. Occupational Therapists identify meaningful goals, that drive you and only you to live life to the full. Because I have my own company, I am free to work with the people and projects that really excite me. An individual who pursues independance or recovery, a company that is passionate about its products, a charity who want to support its members.I am passionate about transformation and change which brings out the best in people and services. I even get to travel locally, nationally and internationally. You can read more about my current work and my interests on my BIO page. We can offer personal assessments to help you or your family member find their unique solution to build independence. We offer professional and managementservices including complaint and investigation management, project work, business planning, service development and return to work planning following sickness absence. Professional support to Occupational Therapists in coaching and mentoring is offered via skype or an in house supervision contract. Working with retailers and suppliers of equipment for independence, adds value to their products and services. We give advice on marketing their products and what you the customer find useful, interesting and attractive. Its our own form of "Retail therapy"